The house is 8.5 ft. wide, 20 ft. long, and 15 ft. high, conforming to the State of Alaska regulations for towing it without needing to get a special permit. I’ve never weighed it, but I’d guess around 6,000 lbs with awning and deck included. The house is built on a 10,000 lb. trailer. The house has 2 x 4 construction with fiberglass insulation (I would go with spray foam if I had it to do again for a tighter seal and less labor intensive insulating) and 2 x 10 roof joists. It is “super-insulated” with 1 in. of rigid foam enclosing the house and insulating the studs from transmitting cold into the house. It is wired and “plumbed” for a propane hookup. I have a kitchen counter, shelves, and sink on one end of the house, with storage loft overhead and a desk/dinner table/office space and window seat on the other end with a sleeping loft overhead. The entry area has high vaulted ceilings overhead and feels spacious. The sleeping loft allows for a 7 ft. ceiling in the study/sitting room. A bathroom would have felt like it crowded to space too much to me, so I use a portable toilet which I store outside the house (REI sells a toilet seat that fits on a five gallon bucket and a toilet kit with landfill-approved degradable wag bags). The bucket can be brought in the house or used outdoors, either in the woods surrounding the house or with a folding blind I built. 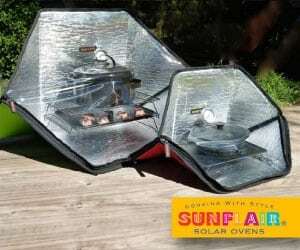 I shower at a local health club or in the woods using a “solar shower” water bag. A friend who lives across the street has also offered use of his shower and bathroom. The house took about 8 months to build in my spare time and with the help of friends. 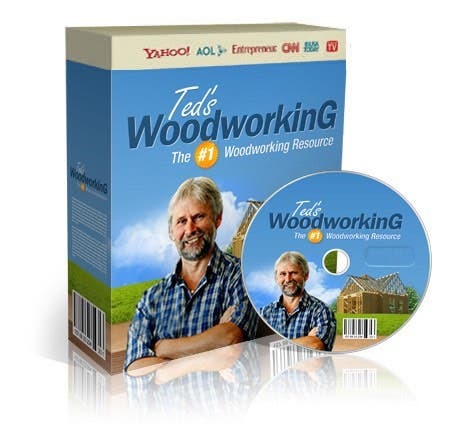 I had been looking at ways to build an inexpensive home, and had seen the Tumbleweed designs. I jumped into the project when a friend who taught construction at a local high school offered to take it on as a class project, thinking it might be more interesting to the kids than building the usual sheds and outhouses. he and his students started construction in March or so, but were only able to get the floor and walls framed by the end of the school year in May. So my friend and I did the rest of the construction over the summer and into the fall: roof, insulation, finish work. Not having planned to be doing so much of the work, I found myself overextended trying to build the house and work full time, which was stressful, and I may have changed courses midstream and aborted the project had there been an easy way to do that. A second motivation for building a tiny house on wheels was that I wanted to live on some property I had acquired and get to know the land and how the sun and wind and seasons interacted with it before deciding what to build and where. 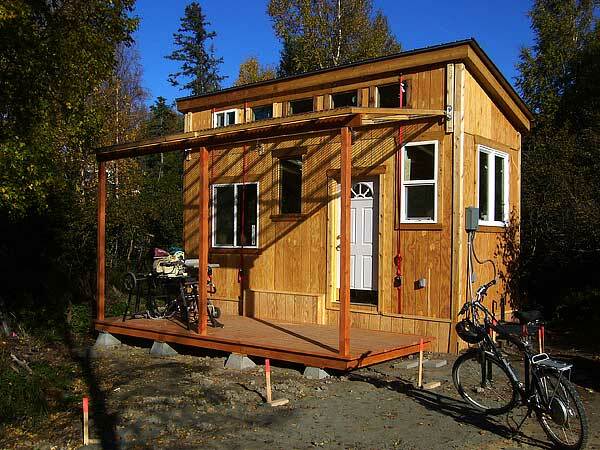 Moving my tiny house onto my property also had its set of challenges since the city of Anchorage didn’t allow a mobile structure on a lot unless a house was already there or in a case where the mobile home was used as a temporary living space while building a house. So I went through all the expense of getting a building permit, paying permit fees, and put in a septic and well in anticipation of starting construction. I heat the house with a 1500 watt electric heater. My electric bill runs $20-30 in the summer and $70-110 in the winter. Electric costs could easily be less, but I like light, and I included lots of windows in the house design. I am pleased with the electric heat because the house has no moisture or mold problems like I’m told it might have with propane heat (or air quality and temperature problems that an wood heat might cause in a tiny cabin). In the course of coming and going through the front door (which is also not tightly weather sealed still), I get adequate air exchange and the house doesn’t feel stuffy. My material costs for the house was about $11,000 including the trailer, labor was $6,400, initial building and electric permits were about $2,000, and another $100 for a phone consultation with Jay Shaffer, who was very helpful with information and advice. I would not necessarily suggest that others use these numbers as a guide to what building such a house might cost. I did quite a bit of research to find low toxicity and inexpensive materials. I was able to get contractor prices on most of the materials. Labor cost reflect the generosity of construction friends who worked for considerably below their normal wage. None of my own (substantial) time and labor is included. Survey cost for permits required by the city are not included. The folding awning doubles the sheltered space, creating a big porch area, which I use for leisure activities, entertaining company, a bike garage, etc. The porch is built in three sections so that it can be easily lifted and hung from i-bolts on the back side of the house for road trips. The shed roof with folding awning and porch design idea came from friends Ian Moore and Jen Jollif, and the ingenious plumbing pipe awning design and other construction details came from Dave Mortensen. I’ve enjoyed living in the house for a year and can’t think of much that I’d change about it. Thanks for sharing your home. I really like the spaciousness of that loft! LOVE that awning! I’m making something similar at my place, just wondering what you used to attach it to your building. Nice place, looks very livable. I attached the straight pipe to the house with standard plumbing end fittings. (See discussion above.) You might be able to see pics on Gravatar, or maybe I’ll get ahold of Kent G. and see if he wants to upload some more close photos of awning. I really like the bright interior . The porch awning is inovative I did something similar on eye bolts to my shelter.will the awning hold up to anchorage winters? I don’t let the snow build up on the awning. I have a ladder leaning against the awning and I get up there with a roof rake made for situations like this and I rake the snow off it. It’s quick and easy to do. It’s had as much as 4 or 5 inches of snow on the awning without a problem. Wonderful! And thanks for showing a normal home with normal things, not like some aseptic designer model. So comfy, homey, sunny and inspiring! You’re welcome. Glad to share. Normally I am tired of the tiny homes on wheels with claustrophobic lofts, but this place is really nice. The brightness and the high side roof makes a big difference. And there is an alternating stair almost identical to one I built for a small log cabin I had (more steps because mine went up to a stand-up height loft)and I am sorry I didn’t think of incorporating the shelves on the backside!! Good work!! Thanks. I like the feeling of space. Nice to have that inside a tiny home. I love all the windows and the light they bring into your home, and a real porch is to be treasured. Thanks for sharing the costs and recognizing those who also contributed. I feel those of us with building skills could duplicate the cost when considering frugality and trading trades skills. I’d like to know more about the plumbing pipe awning design, the photos just aren’t definitive enough. Very nicely done !! Thanks, Joe. This project would never would have happened, not even close, except for the friends, family and aquaintances who took an interest and helped out in one way or another, so I’m glad to appreciate them here. Paul Wunnicke helped me build the beautiful deck in three parts so it would be easily moveable. I don’t see an easy way to upload photos here, so I’ve posted my best 3 pictures of the awning on Gravatar as suggested on this website, but I have no idea how Gravatar works. I thought it was a photo sharing site, but I don’t see any way to access photos there. The plumbing pipe runs through holes drilled in 2×3’s and it secured at both ends with two 90 degree plumbing pipe ends that screw into the straight pipe and which we screwed into the house framing. The long run of straight pipe is supported in the middle by a steel support that’s made for garage doors, which is screwed into the framing. Dave Mortensen came up with this ingenious design. I was initially worried that the awning would act like a kite and just blow off in the strong winds we get on the Anchorage hillside, so I rigged an elaborate rope system to help me lower the awning in the case of high winds (I can lower the awning by myself in good weather but figure it would be dangerous to try to lower it alone in high winds as heavy as it is). I was pleased to find that the 60-80 mph winds we sometimes in this area get didn’t seem to stress the awning at all. Just last night the awning and little house withstood hurricane force winds, which was measured at 120 mph in some parts of the Anchorage hillside, the strongest sustained gale (all night) we’ve had in this area in 30 years according to a neighbor. The winds, which bent trees sideways, did stress the awning, but it held. This is AWSOME! I am in process of building a Tiny Home, but I really like your design. Would really like more information on porch and awning. Would really love to come to Alaska, is land expensive? What info would you like on porch and awning? Land in Alaska tends to be more expensive near population centers and less expensive in more remote areas. In Anchorage, there are not so many lots available, and I think they tend to run $100,000 and up. You can search remote lots in Alaska online. Love the porch and the roomy loft! It’s always nice to see a design that stands out from so many of the tiny houses! Nice work. I built mine with styrofoam sheets as insulation, but did not add extra between the frame and siding. The materials cost was quite reasonable for what was built. 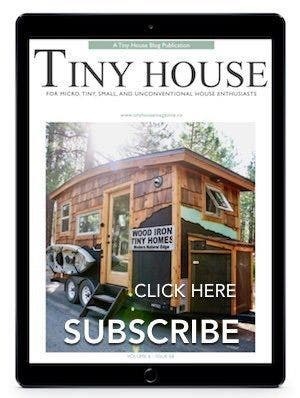 It’s like you took a page right from my notebook and created my dream tiny house! Thank you for taking the time to document and share. It’s incredibly inspirational! Looks good! I love your foldable awning and porch and all of the windows. 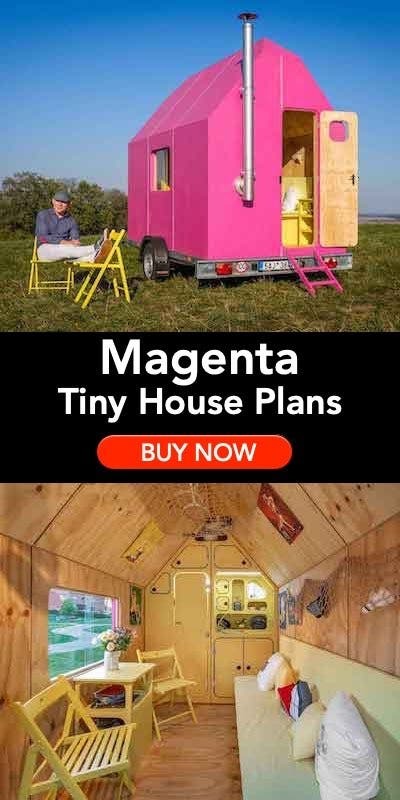 This might convince me to change the design of the tiny house I’m working on! Can we get a picture of the kitchen end of the house? There’s the one of the counter but it’s way more close up. Thanks a lot! I don’t see an easy way to upload a photo here. I just put two kitchen photos on gravatar, but I don’t know how that works. The kitchen is a counter running the width of the trailer (like the desk you see at the other end of the trailer) with a sink, shelves and counterspace on both sides; kitchen cabinet and shelving underneath and a bucket to catch sink water. Wow—really nice work, Kevin. The extra height gives a great feel and look to the place. Congratulations on such a wonderful space! I love, love, love that loft. It looks both comfy and spacious, tiny but cozy. I think lowering the ceiling a bit with some of these tiny houses to give you that wee extra bit of head room in the loft is the way to go—-plus those sliding screened windows. Must be absolute heaven! Yes, it’s a pleasant place to hang out. I like your house. Nice design to have so much windows. It must be exciting to shower in the woods though. lol I can’t wait to share our tiny house someday soon! The woods are on my land, so I don’t think it would be a problem. I haven’t actually needed to do it since I use the shower at my athletic club, but I used to guide wilderness trips and on the longer trips I’d take a “solar shower” bag along. They’re great. Showering in the woods with sun-heated river water is a joy. Thank you so much for sharing your build. It’s great. It’s pleasing to the eye and looks very practical as well. I, too, love the porch and was considering something similar with a clear roof to let the solar heat in the winter and maybe put a shade cloth underneath it for shade in the summer. I would also need to screen it in with our mosquito population to make full use of the porch. I was thinking of making some portable screen panels that are bolted together so they can easily be taken apart for moving. My question is: does the clear roof really allow the passive solar to come through the windows in the winter. I currently get passive solar in my apartment in the winter and I can turn the heat off throughout most of the sunlight day when it is sunny. I would love to be able to do the same for a tiny house. I appreciate you sharing your electric utility costs as I was wondering what it takes in a northern climate. What would you say your R-values are in your floor, walls, and ceiling? I love the clear awning. I don’t feel at all shut off by it from the sun and sky. Whether is diminishes the sun’s heat, I don’t know. I imagine it does somewhat. I don’t remember the R values of the house, but I think there’s a simple calculation that you can probably find on the internet, or a construction friend could probably tell you (with this info): walls and floor are 2×4 with fiberglass insulation; the framing is covered on the outside by 1″ rigid foam all around. Roof is 2 x 10 with fiberglass insulation and 1″ foam board on the interior side of the roof joists. I’m also curious about your wood skirting. How did you secure it to the house and are you experiencing any rot with it? The skirting is attached to 2×4 framing, which is was built just to hold the skirting and screwed to the bottom of the existing house frame. I haven’t experienced any rot yet. The great skirting work was done by Steve McIntryre and Chico Flores, who do a lot of trailer skirting and other kinds of trailer work at a trailer park in East Anchorage. They also helped me put the trailer on concrete blocks and level it, taking the load off the wheels. I had already put the trailer on blocks and leveled it, but I had the blocks turned the wrong way for maximum load carrying efficiency; I was also perplexed by the fact that when I got the house perfectly level the front door wouldn’t close. It was great to have their expertise. My recollection is that Steve said sometimes the skirting wood will begin to rot after 8 or 9 years. Using treated framing material and just planning on replacing the T-111 panels every 10 years might be a good solution. Did you purchase your interior wall wood tongue n groove here in AK? Was curious where you picked it up? Yes, I got it here. The home improvement stores carry it. Wow, that’s a high electric bill. I think spray foam insulation in the floor, walls and roof for a tighter seal and better insulation would have brought the electric bill down. That’s one thing I’d change if I could. But I like all the windows, good lighting and electric heat inside the house, so the trade off on electric cost is worth it to me. Kevin your little house is awesome. I’m not much on the lack of bathroom lol, but other than that it looks great! Like the rest of the people here I love the porch. I have been planning a folding porch for mine as well but wasn’t sure how to attach it so it could just live there full time. Love the pipe idea. Genius! Thanks for the pictures and sharing! I hope you have many more happy years in your little house! 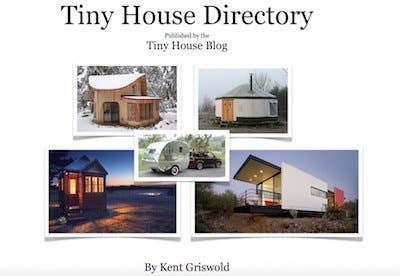 I like your tiny house a lot! I like the table in particular, it’s so well lighted!! I’m still far from being able to build my own tiny house, but I think this would be my base project! I would just add a toilet and a shower, just for self-sufficiency. And to lower the electricity bill (or get rid of it definitely) why don’t you consider solar photovoltaic panels ? Also, idk, why don’t you consider japanese futon instead of typical mattress? I live in Anchorage and own land on the hillside in a “land use” area. I’m attempting to legally build a tiny house, and understand that new construction requires a well and septic. I was wondering if you’d be willing to tell me how much this cost you. I’ve reached out to a few engineering firms and haven’t heard back yet. Its unfortunate you can’t simply go dry or camp on your own land! Same boat here Rebecca and Kevin! We have a awesome chunk up Kings Way and are working on planning as well. Rebecca: I have spoken to a good well driller named Johnny (907)830-9985 and he quoted $42/ft. You can look up on the Muni maps site on well history to find wells in your area for a depth idea/if bedrock is encountered. Septic involves a lengthy assessment and testing for groundwater percolation (when ground isn’t frozen). Based on soil results, system will range in drainfield area and cost. Could be 3000 for gravity fed and 100 sqft field/br, could be 20000 for insane mini treatment plant 4br setup in pool soil. Kevin – did you lay pipe for your well and septic, just do install, or just get the permits? Also, I do insulation contracting and might be able to hook up some spray foam for cheap/free. It might be cool to meet up and trade ideas and experience. Let us know! 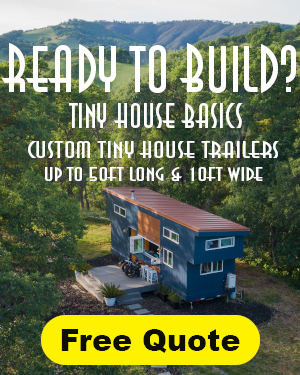 I TOO am looking to legally get a tiny house on to a lot I am looking into… Would love to hear how to go about it and meet with like-minded people! I am currently living in it out in the Wasilla area… Let me know! Fantastic story on your tiny home, congratulations, many are starting to realize that a tiny home may be just the next real home they will ever own outright. How much for the well permit and for the septic system, I asked the city and you can actually just have the permits and not have the septic system in as you build it is only if you want to live in the home that you need to have some sort of septic system in …what was your cost for this. as I did not acquire permits, now I am obtaining permits, however now they are saying my land is too small for a well and septic system which is odd being it will be a tiny home and my land is a good size lot of 9100 …sf, do you know where I can find the legalities to this.